THE QUALITY AND DETAIL ARE EXQUISITE! THIS CAKE PLATE IS ABSOLUTELY GORGEOUS! THIS PEDESTAL CAKE PLATE IS QUITE SUBSTANTIAL WEIGHING APPROXIMATELY 4 1/4 POUNDS IS AN IMPRESSIVE SIZE MEASURING APPROXIMATELY 5" TALL x 12 1/2" WIDE. THIS CAKE PLATE IS NOT SIGNED AS IT IS A PRE-1970 PIECE. 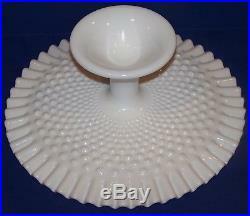 YOU WILL NOT BE DISAPPOINTED WITH THIS EXCELLENT GENTLY USED CONDITION "FENTON" ART GLASS MILK GLASS HOBNAIL PEDESTAL CAKE PLATE! THE ONLY THING I CAN FIND UPON INSPECTION IS THE TOP OF THE CAKE PLATE HAS BEEN USED AND DOES HAVE SOME LIGHT SCRATCHES. THE ABOVE MENTIONED IS NOT REALLY ANYTHING! I EVEN ONLY MENTION TO BE AS ACCURATE AS POSSIBLE WITH MY LISTING! YOU WILL NOT BE DISAPPOINTED! THIS GORGEOUS PEDESTAL CAKE PLATE WILL MAKE A STUNNING ADDITION TO YOUR "FENTON" ART GLASS MILK GLASS HOBNAIL COLLECTION OR WILL MAKE A STATEMENT IN YOUR FINE ENTERTAINING! I WILL CAREFULLY PACKAGE YOUR LOVELY VINTAGE "FENTON" ART GLASS MILK GLASS HOBNAIL PEDESTAL CAKE PLATE IN BUBBLE AND STYROFOAM PEANUTS. 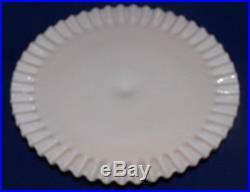 The item "LOVELY VINTAGE FENTON ART GLASS MILK GLASS HOBNAIL 12 1/2 PEDESTAL CAKE PLATE" is in sale since Sunday, June 3, 2018. This item is in the category "Pottery & Glass\Glass\Art Glass\North American\Fenton". The seller is "fabcollectibles4u" and is located in Oswego, Illinois.